OU researchers have received a grant to define and develop the concept of ‘empowering methodologies’ in the postcolonial, globalised context of India. Emma Bell, Professor of Organisation Studies in the OU’s Faculty of Business and Law, has secured funding from the UK-India Education and Research Initiative (UKIERI) for the £50,000 Developing Empowering Methodologies in Business and Management Research project. 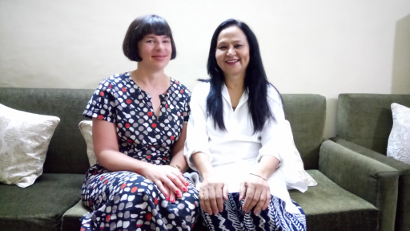 Professor Bell and her colleague, Dr Tim Butcher, Senior Lecturer in People Management & Organisation Studies, will work in collaboration with Professor Sunita Singh Sengupta from the University of Delhi to develop the concept of ‘empowering methodologies’ in management research in the postcolonial, globalised context of India. The project will enhance research capacity, develop researchers’ skills and strengthen methodological understanding of approaches to business and management research that seek to empower research participants. The project will involve six Indian research case studies which form the foundations for development of a suite of multimedia, open-access online learning resources and a research monograph. The project will involve the use of politically-aware, humanist methods that ensure researchers’ ethic of care towards participants and enable them to speak openly, including in ways that potentially challenge dominant managerial perspectives. The project team will be involved in staff and PhD student exchange visits during the two years (April 2018 – February 2020) and will host a two-day conference on Empowering Methodologies in the UK in May 2019. Find out more about OU research, on The Open University's research website.